Ok, so what’s the big deal? First a spot of history. Google Checkout’s release in the summer of 2006 was epic. They offered some of the lowest payment processing fees in the industry, a very simple and convenient checkout which can be as straightforward as a button on a webpage through to integration into almost all the popular eCommerce systems. Google offered everyone who advertised with them a discount on their fees too. It’s little wonder than EBay, the company who own the rival payment processor PayPal, saw their shares drop 7% when Google Checkout came out. This might have been due to rumours about a Google auction site but largely this was the result of an efficient, trusted payment processor. It’s not rocket science to realise that this will effect, for the worse, the bottom line of every business that processes sales via Google Checkout – effectively squashing the gross profit margin on each sale by up 1.9% or more if you are an existing Google Adwords customer. So let’s move to the competition, then? When Google decided to re-price their services they must have taken a sheet of tracing paper to PayPal’s website, since the transaction costs are almost exactly the same. PayPal don’t do the sucky secret additional 1% on international sales though. There is no material advantage for using one payment processor over the other. PayPal has a more complex system that takes longer to get set up with and PayPal also have a history of terrible customer service so I’m unlikely to make a protest of the existing Google Checkout price hike by moving to PayPal. On the other hand what I may as well do is now offer PayPal alongside Google Checkout. Joe Bloggs at Joe’s ISV Limited sells around 80 copies of a £15 product every month, generating a turnover of £1,200 per month. He currently pays Google an average of £30.00 per month for handling these transactions. If he is a Google Adwords user, he would pay even less. Under Google’s new prices he will now be paying Google £57.51 – an increase of £27.51 per month (or £330.12 per year). In order to maintain his profit margin, Joe will have to increase the price of his product from £15.00 to £15.35. If Joe’s ISV Limited is a UK based company that sells mostly (assuming all) to the US, the costs start to become a more prohibitive £68.80 per month instead of £30.00. His product will need to be priced at £15.55 to take the hit. Mrs Sterling offers a hairdressing service where people can book online and pay via Google Checkout. Each booking costs £20. She sells around 25 per week, making a monthly gross profit after Google of £1955. Under Google’s new system this would be reduced to £1912, costing her an additional £43 per month (or £516 per year). Under my financial assumptions for these scenarios I am assuming (correctly) that Google Checkout and PayPal will levy their charges on the VAT portion of the sale. And since you cannot pass VAT charges onto HMRC or the EU, the non-VAT portion of the software price needs to increase much further than the charge rate, making the situation even worse. In my own situation, the cost of selling a CIS Solver license online will increase from £6 per licence sold to £14 per licence sold. Thanks for the warning, Google! 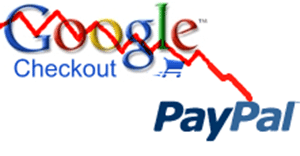 I suspect that those businesses who currently offer Google Checkout and who sell to consumers will likely also offer the more popular consumer-friendly PayPal format, perhaps even dropping Google Checkout altogether in favour of other payment processors who are now much more competitive, such as Worldpay or one of the (for software companies) US-based payment processors. Will this pricing strategy affect you? Please let me know with your comments below. Web browser wars: Room for one more? Google launch "Google Chrome"
Next Post Find me on twitter! I know I’ve just about finished a 3 month switch over to a new shopping cart system which supports Google Checkout: so to find (within a week of being reayd to launch) that the fees are going to be the same as Paypal… I am wondering why I should bother with Checkout after this fee increase! However I can see your pain here, and you have my sympathy. Personally I prefer FastSpring: http://www.fastspring.com Not the cheapest to be sure, but reliable and predictable, something I’ve come to value highly in the last two decades online. I didn’t realise Google Checkout wasn’t available in Aus! But for us businesses in the UK that use Google Checkout it is an uncomfortable hit especially in the current economic conditions. I do appreciate your situation though, have you considered handling some of the stuff like consulting via your own merchant account? I find it disgusting that Google, a multi-billion dollar company would nickle and dime their most loyal customers (merchants) in such a hard recesion like this. I am slowly losing my loyal fan base to them. Not only did they increase fees but they got rid of the ability to link your adwords account with the checkout account, which gives a ratio of free credit card processing to the amount you spend on marketing. Google should be ashamed and they are going to be seen as greedy as Paypal if they keep this up. lol i just joined google checkout today, i have to wait 3 days for bank authorisation, but i thought b4 when i checked a year ago that google was cheap, but then i checked their rate and wow they are expensive, i never thought google would be so stupid, i have been using NOCHEX for over a year now and they only charge 2.9% atr the lowest level which in my mind is a lot better, at least it gives the small businesses a chance in this over competitive market, the big players have many more advantages already and can afford to pay high commision. Anyway Nochex does have a setup fee of £50 but they seem very pro, at what they do, you will have your own account manager with a direct number which is very important, also if you talk to your account manager and ask them to reduce the commision they will.